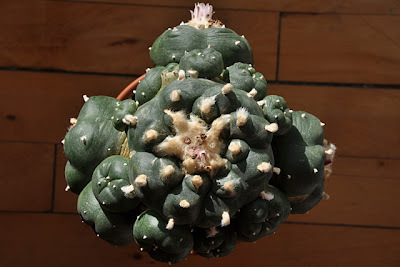 A week ago my grafted Lophophora williamsii (SB 854; Starr Co, Texas) celebrated its 6th anniversary sitting on top a sturdy Trichocereus pachanoi stock. 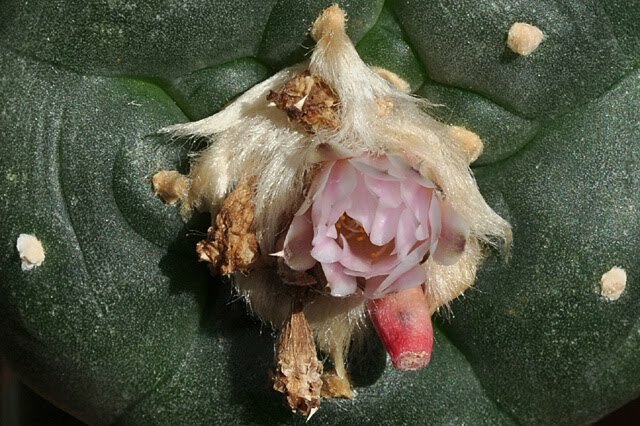 The plant was grafted as a tiny seedling and in 6 years the main head has grown to a width of approximately 8 cm (~3.2'') – the 3 largest offshoots are 6 cm (~2.4'') wide each. The main head seems to have stabilized at 8 ribs while the largest pups are in transition from 5 to 8 ribs. The last couple of weeks the plant has “popped out” fruits resulting from last years late flowers. This season’s first flower appeared a couple of days ago and was promptly (self-)pollinated – according to previous experience this should result in another fruit in 7-8 weeks time. I’m wondering for how long the Trichocereus pachanoi stock will be able to support the rather large Lophophora williamsii scion. This is my oldest graft so I have no experience to rely on regarding the actual longevity of Trichocereus stock plants; I guess time will tell. 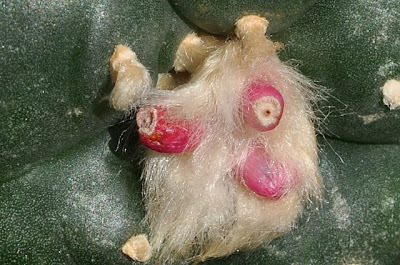 For comparison you can check the posts on the same graft as one, two, three, four, and five years old. Fantastic your blog and this grafted lophophora. do you think this is a good way to improve the seed production? 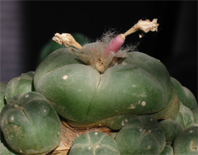 i see you have this plant for six years, trere are more flowers in a graffted lophophora than in no grafted? 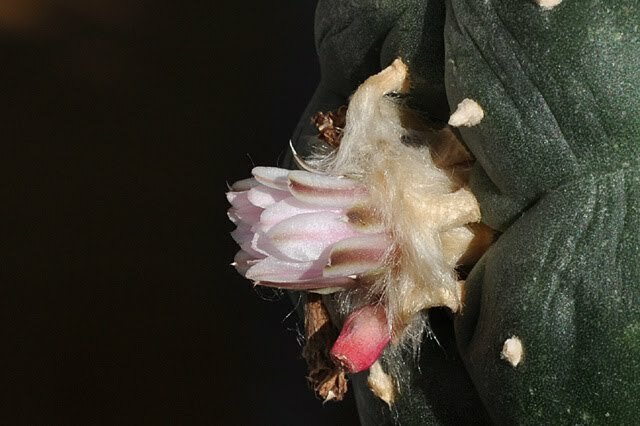 Incredible results¡¡, in fact last year i grafted one lophophora in a pachanoi, but it was in october and now is starting. 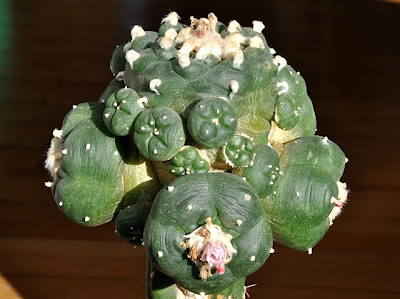 I have a slow growing collection because i don't like to use many fertilizer but i thought about this to produce more seeds in some mother plants and then i find your page, thank you very much for your answer. I'll tell you about experience.